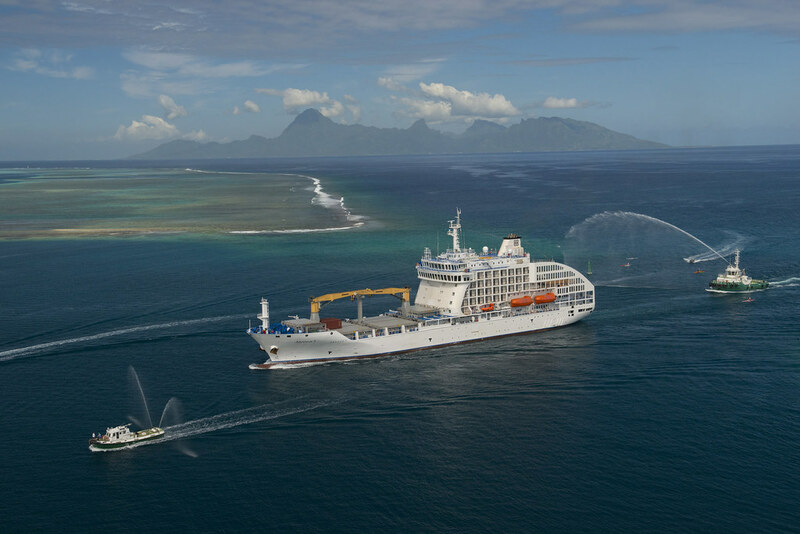 Travelling around the most remote group of islands in French Polynesia on board a working cargo ship has become even more appealing, following the unusual announcement by Aranui 5 that it is offering a 300 euros per person onboard credit on selected 2017 departures. The generous credit, which is available on all new bookings made before 31January 2017, for departures on 7 and 25 March, and 13 April 2017, may be spent on board the Aranui 5 in its bars, boutique and spa. Passengers may choose to treat themselves to exotic tropical drinks at one of four bars on the ship, including the panoramic 'Skybar, or make a purchase in the boutique where traditional Tahitian goods include the pareo, a lightweight, brightly coloured garment similar to a sarong. Alternatively, the credit can be used in the spa, where guests may indulge themselves in a full body massage or other health and beauty treatments. Passengers travelling on 'The freighter to paradise' will be greeted in the traditional Polynesian way, with the warmest of welcomes and a fresh flower garland or lei, as they travel the 2,200 miles from Papeete in Tahiti to the stunningly beautiful Marquesas Islands. The 14-night voyage, which stops at each of the six inhabited Marquesas, gives travellers the opportunity to meet islanders, marvel at the amazing volcanic peaks soaring thousands of feet into the sky, hike to spectacular waterfalls, visit one of the many archaeological sites with their distinctive stone tiki statues, and learn more about the ancient traditions and artistic heritage of the Polynesian culture. Prices for a 14-day voyage, including all taxes, start from 2528 euros in a class C dormitory (no children under 15 years, four to eight guests), from 4088 euros in a standard double cabin, and from 5579 euros for a premium suite with private balcony, based on two sharing. Meals, wine during meals on board, planned excursions, expert lecturers and guides are all included, together with the 300 euros per person credit, which is not refundable if unused. For further information about cruises on board Aranui 5, visit www.aranui.com.